Mrs Fox’s especially loved throwing parties for her little uns. Soon friends were asking for her help with their parties too. So she created beautiful and unique themed parties for crafty children. 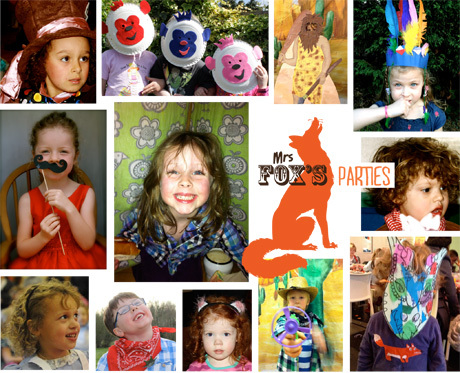 Mrs Fox’s builds a party around a theme that will inspire a child’s imagination; we can provide the bare minimum to the whole shebang! Our bespoke service caters for children’s parties of any size. We presently operate in the Hertfordshire and North London, but are always ready for a challenge. Much of our own party-wares are lovingly handmade and we source the best quality, creative and designed goods from boutique suppliers. Mrs Fox’s will create a theme for you, or if you have an idea of your own we will work with you to turn it into the perfect party. We will work closely with you to create a unique party for your child. We can provide CRB checked entertainers to run the party or you can run it yourselves with one of Mrs Fox’s Party Boxes. Our party boxes include everything you need to run your party, we give you tips and advice all delivered to your door. Mrs Fox’s on-line shop is a fabulous bazaar of hand-made children’s gifts, crafts and partywares. Mrs Fox’s Crafty Boxes are designed to inspire your child, to unlock and expand their imagination. Starting in Easter 2013 Mrs Fox’s has been creating themed craft kits for children delivered to their homes monthly. Our imaginative boxes are jammed with crafty ideas – plenty enough to satisfy several small people at least. We don’t like waste, we even include our packaging in many of the crafts and we like to use as many recyclable materials as possible. To see just how crafty Mrs Fox really is seek out Mrs Fox’s Handmade we sell on-line through Folksy.com and Etsy.com. In all that we do Mrs Fox’s wants to help other parents have fun and encourage creativity in their children, without filling the world’s land-fills. Where possible, her craft kits and party-wares use natural products, are biodegradable, recyclable or repurposed. Her gifts are crafty, imaginative, keepsakes, a little nostalgic and lots of fun. Mrs Fox does not claim that she will never, not ever, use plastics for example, but there will always have been care and consideration in her choices. The images of the goods on our website are for illustrative purposes only. Although we make every effort to display colours accurately, we cannot guarantee that your computers display or the colours on printed pictures accurately reflect the colour of the goods. Your goods may also vary slightly from those images particularly where the goods are handmade and each product produced is unique. We accept online credit card, debit card and Paypal payments. We use Paypal to process our payments but you don’t need a Paypal account. Look for the Don’t have a Paypal account? link on the payment page. If you’d like to use another method of payment than those listed above, or if you have any difficulties and need assistance please contact us info@mrsfoxs.com and we’ll sort something out. Prices on the site include UK VAT currently at 20%. Please read the listings carefully, as some of our products are made to order. We will contact you as soon as we can to confirm that we have received your order, and to let you know when you can expect your items to be posted. We try to complete orders within 48 hours, but sometimes they take a little longer depending on how busy our shop has been that week and whether your order includes handmade and personalised goods. Letter sized products are sent Royal Mail first class, but most of our packages will be sent by courier, and require a signature. Deliveries will take approx 3-5 days. (please see the party boxes page for the exception to this rule). Cost of delivery is calculated on your total purchase by value bands. £0.00 – £4 .99 is £1.90. Between £5 and £24 delivery is charged at £4.50, between £24 and £60 the cost is £5.50 and between £60 and £200 the cost is £6.50, any purchase over £200 and the postage is FREE of charge. We can arrange delivery to countries outside the UK. Please contact us via email with your desired order, info@mrsfoxs.com and we will get back to you with the postage cost. We want you to be really happy with your purchase. If you are not, please let us know as soon as possible so that we can try to rectify any problems, or arrange for an exchange or a refund. In the event that you wish to return an item, it must be returned within 14 days of receipt (at your own cost) and be unused, in it’s original packaging and in a sale-able condition. Upon safe return a full refund for the cost of the product (excluding the original p&p) will be made within 30 days of the product reaching us. We will not be held liable for refunds on goods that; show signs of willful damage, accidental damage or negligence by you or any third party; that have been damaged by inappropriate use or that have been altered by you or a third party. Please contact us with your order number if you’re ever concerned about an order that hasn’t arrived when you expected it to. If the return is clearly a result of a mistake by Mrs Fox or if the goods received are defective then we will refund the cost of goods and delivery charges too. If you decide you no longer require your goods (excluding personalised and commissioned handmade goods) please email us within 24 hours of placing order at info@mrsfoxs.com. If your goods have not been dispatched a full refund will be processed. If, however, your goods are already on their way please follow the returns policy above. Unfortunately, as personalised and commissioned goods are made to your requirements, you will not be able to cancel your order once made. We are a web based shop so do not have standard opening hours but if you email us we will aim get back to you within 48 hrs. Please contact us by email, info@mrsfoxs.com, and we will be happy to help you with any queries you may have. We may have to cancel an order for goods, including personalized and handmade goods before the goods are delivered due to events outside our control or the unavailability of stock. We will contact you within 2 days or sooner if this happens. If we have to cancel an order and you have made a payment in advance for goods that have not been delivered, we will refund these amounts to you. The content of this website is for your general information and use only. It is subject to change without notice and any changes will take effect immediately. The information is provided by Mrs Fox’s and while we endeavour to keep the information up to date and correct, we make no representations or warranties of any kind, express or implied, about the completeness, accuracy, reliability, suitability or availability with respect to the website or the information, products, services, or related graphics contained on the website for any purpose. We cannot provide any warranty or guarantee as to the accuracy, timeliness, performance, completeness or suitability of the information and materials found or offered on this website for any particular purpose. Content is owned by Mrs Fox’s and reproduction without permission is prohibited. Any websites or blogs linked to Mrs Fox’s are beyond our control and we are not liable for their content. Mrs Fox’s is committed to ensuring that your privacy is protected. Should we ask you to provide information by which you can be identified when using this website, it will only be used in accordance with this privacy statement. Mrs Fox’s may change this policy from time to time by publishing to site. You should check this page occasionally to ensure that you are happy with any changes. All product prices shown on our website are shown in UK pounds Sterling and exclude delivery charges. However, all prices include VAT at the appropriate level. Payment for goods will be via credit or debit card using a fast, secure and convenient checkout from PayPal. PayPal is a free service allowing buyers to make purchases securely, quickly and conveniently online and having a PayPal account is optional. PayPal uses cutting-edge data encryption, fraud detection tools and all kinds of other advanced techniques to improve security. Loved the windmills. So, how did you make them? In the blog I have just posted a new make that explains how to make the windmills, it’s very easy! Thank you so much for providing such an excellent box of goodies for my daughter’s 3rd birthday fairy tea party. She and her eleven little guests had a marvellous time decorating fairy cakes, making fairy craft and unwrapping your ready-made pass the parcel game. The party table and decorations looked really magical. Several of the mums commented on the beautiful drawstring party bags. 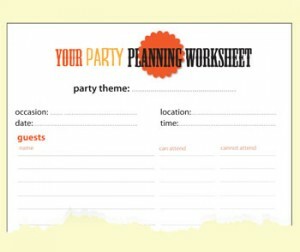 I loved your ideas and planning sheet, which took all the hassle out of arranging the party so I was able to play with the children and take lots of photos. I will certainly be contacting you again next year for another of your party boxes – theme as yet undecided! Well done mrs fox! Elsie and Joe would like me to re-create in Sydney for them.